Member of Parliament from Gurudaspur and Veteran actor Vinod Khanna passed away on Thursday in Mumbai. He breathed his last at 11.20 am on Thursday. He was suffering from advanced bladder cancer. Vinod Khanna had been ailing for long recently. He was admitted to the Sir HN Reliance Foundation hospital on March 31 with severe dehydration. 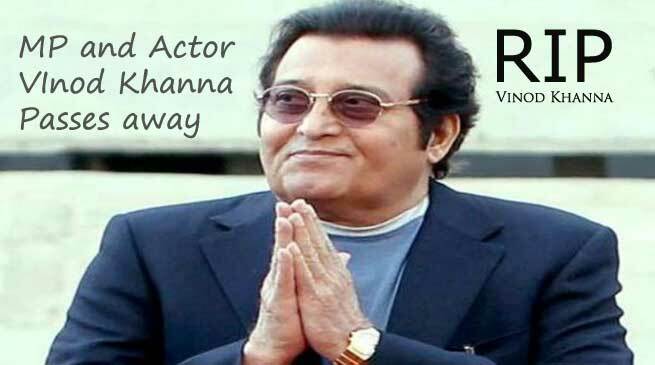 The actor debuted in 1968 with ‘Man Ka Meet’ and is best remembered for his performance in films like ‘Mere Apne’, ‘Mera Gaon Mera Desh’, ‘Imitihaan’, ‘Inkaar’, ‘Amar Akbar Anthony’, ‘Lahu ke Do Rang”, “Qurbani”, “Dayavaan” and “Jurm”. He was last seen in Shah Rukh Khan-starrer 2015 film “Dilwale”. In 1982, at the peak of his film career, Khanna decided to quit the film industry briefly to follow his spiritual guru Osho Rajneesh.